Multímetro digital de alta calidad de nueva construcción, aprobado GS, con pantalla LCD retroiluminada de 4 ½ dígitos (escala completa 21999), gráfico de barra analógica de 46 segmentos e interfaz USB para una fácil conexión a una PC para grabar, control y captura de datos dinámicos y transitorios. Protección total de las entradas, facilidad de control para elegir las funciones de medición. Otra característica importante es la medición del valor real (TRMS) de voltajes y corrientes. AC. 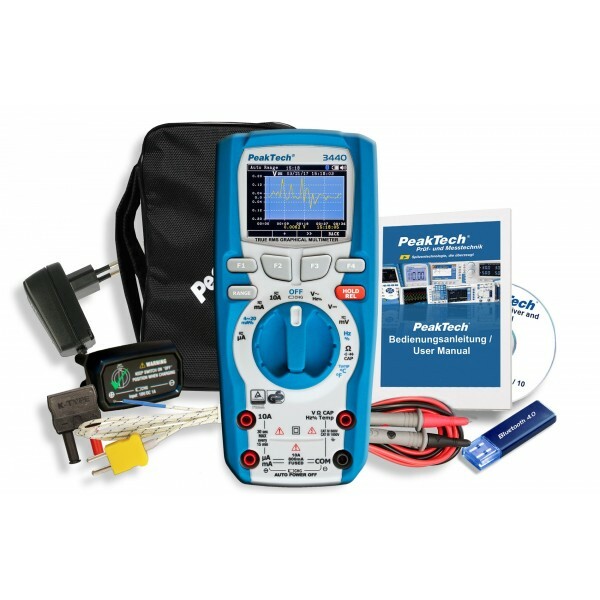 This innovative graphical multimeter convinces through its modern design and the high variety of measurement functions, as well as the consistent design only to the latest technical achievements. 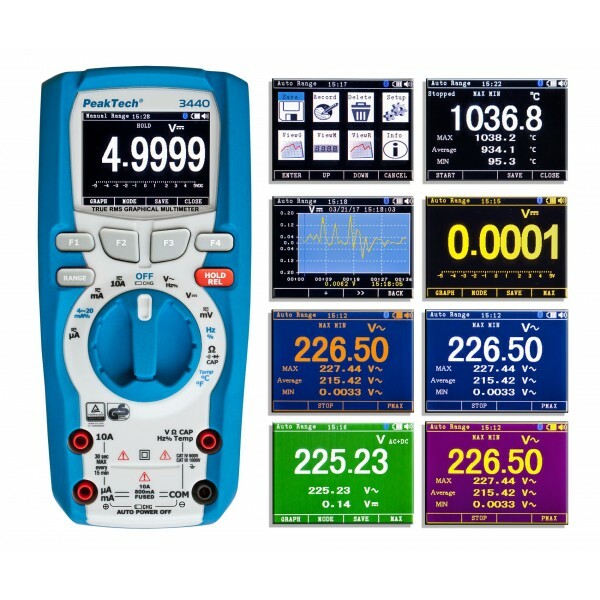 The backlit TFT color display shows the various menus of the graphical user interface, the measurement points of the data logger recording, and the measured values of the multimeter function with its reliable, high precision 4 5/6 digits LCD display. The resulting measurement data can be displayed and saved via Bluetooth by an App (iOS / Android) on your smart phone. 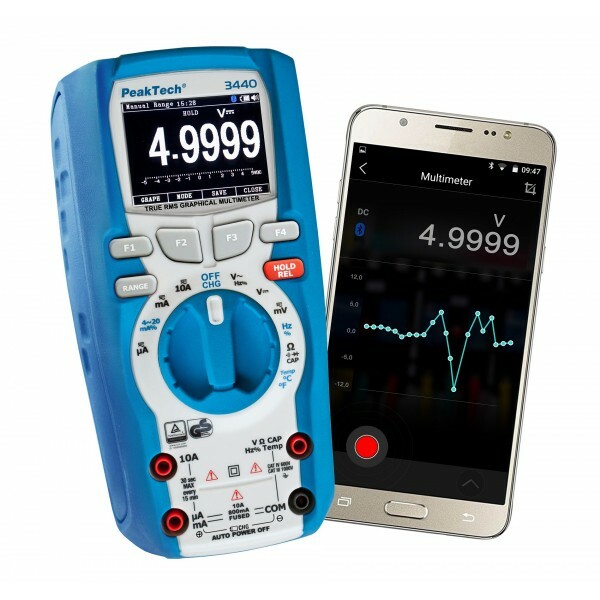 In addition the new PeakTech multimeter App has the ability to forward the data directly from the mobile phone by e-mail or to save as a data table. 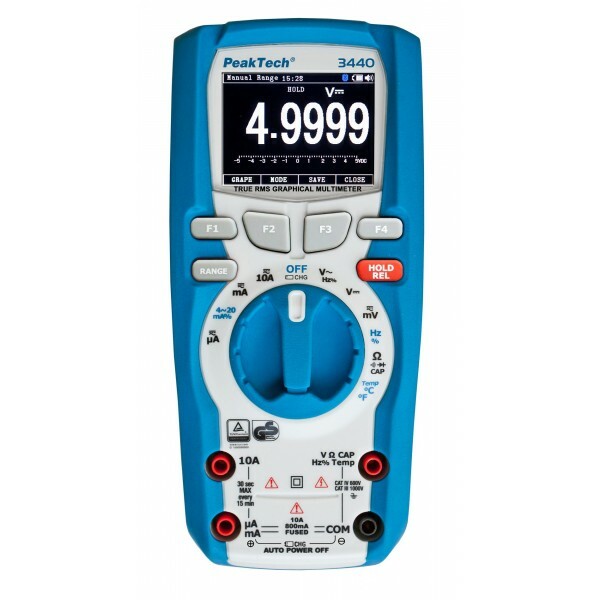 Due to the extensive measurement capabilities and intuitive operation mode, this device is well suited for each professional repairman, electronic engineers or technicians who are interested in a sturdy, highly precise and technically powerful multimeter.